The world has a number of good-hearted donors wants to help for the poor people. But they can’t reach those people very easily. So they are preferring the crowdfunding and non-profit organization, which have a direct link with them. In these days, the website plays a key role in all the activities of the world. Therefore the NGO’s also started their own websites. Notably, many numbers of NGO’s, using the WordPress platform to get a clean and professional online website. Because the WordPress offers you good-looking website with awesome functionalities at low cost. We have a presented a collection of best crowdfunding WordPress themes here. These themes offer lots of stunning features, they will make your website highly engaging and attractive. Make a look down and choose the best one for your website. Go ahead now! Wings Charity is an attractive and winning for crowdfunding WordPress theme. This theme is perfectly fit for social causes, a relief organization, nonprofit, charity, and crowdfunding websites. There are many awesome features added with the theme. The theme comes with attractive homepages designed with handcrafted elements. Therefore, you can create a fabulous front look for your website. Also, you have additional inner pages like service, gallery, and contact. Which helps you to visualize your social services and activities in eye-popping look. Not only that, the theme is fully compatible with the WooCommerce so you can sell your products directly on your websites. Unity is the best WordPress crowdfunding theme. This theme is fully responsive and retina ready. So it fits in all type of modern handheld devices like mobile, iPhone, iPad, laptop and computer desktop. This template comes with Visual Composer, you can create and edit any section or page as per your idea. Following, the Slider Revolution empowers you to create highly attractive slider animations, that seizes your viewer’s eyes on the first visit. Humanity is a simple and clean WordPress theme uniquely designed for crowdfunding websites. The theme has three highly attractive home pages with unique elements. Humanity empowers you to visualize your social activities and works with a pleasant look. As well, each and every page of the theme is fully responsive and retina ready. Therefore, you can share your website content for your donors all around the world easily. The theme is fully compatible with the events calendar so you can present your upcoming events for fundraising on the most enhancing look. After all, the theme has the best friendly support and well-explained documentation. So you can build your own website without anyone help. Born To Give is a modern and highly customizable theme built for crowdfunding websites. The theme is fully coded with the bootstrap, so your website will suits on all modern devices like mobile, iPhone, laptop and desktop and so on. This theme has the powerful Visual Composer and Slider Revolution plugins. With them, you can create and edit the website pages and sliders easily. On the other side, you can sell any product you want with the help of WooCommerce. The act is an outstanding multipurpose crowdfunding WordPress theme. It is suitable for crowdfunding, a nonprofit organization, and charity websites. This theme is fully customizable with easy drag and drop options. Because the theme is fully compatible with the Visual Composer. As well as, it offers unlimited icons to find the best one suits for your designs. Not only that, the theme comes with well-explained documentation and friendly support to make your website creation very simple. Backer is one of the best premium crowdfunding WordPress theme available on the market. The theme envelope with more number of cool features. First, the theme has two dazzling home pages with nice elements so you can share anything you want about your organization in a fantastic look. Backer comes with WPML empower you to create a multilingual website to share your best works and activities in various languages. At the same time, the Visual Composer allows you to create and customize any section in any page within clicks. Not only that, but also has the powerful Slider Revolution plugin, Which helps create an enticing sliders yourselves. Sahajjo is an awesome theme created for the crowdfunding theme. As well as, the theme will perfectly suit for all kinds of nonprofit organization websites. Are you want the website as like as theme view. With a single click on the demo import button, you can achieve your goal easily. Further, the theme is fully responsive and retina ready so you can visualize your website contents highly impressively on all hand-held devices. Also, the theme is fully SEO friendly, therefore you can easily obtain the best ranking on all search engines. King Composer is the best feature of the theme, using this page builder customize theme design as you desire. Likewise, the donation plugin is another feature, that makes your donation collection work easier. Fundingpress is a creative crowdfunding WordPress theme. This theme is fully built with the Visual Composer. So you can create and edit the website as you want in a few clicks. As well as, the theme is fully compatible with the WPML. Therefore, you can translate your website to any language you want in a short time. If you are interested to showcase your services on the website slider. With the Slider Revolution plugin, you can do this work more easily. Backnow is a beautiful and engaging WordPress crowdfunding theme. The theme is a perfect choice for building the crowdfunding website. You can achieve the best ranking in all search engines. Because the theme is fully SEO optimized. Do you have any idea to sell the products directly online? Don’t worry the WooCommerce will make your work easier. By installing the WooCommerce plugin you can add your product images and their details straightly on your website. So that, the customer can easily order the products directly from the home. InCharity is an elegant and flexible crowdfunding theme. This theme is an excellent choice for building a crowdfunding website. There are 6 awesome homepages with excellent elements are ready with the theme. With them, you can construct a visually appealing appearance to the website home page. Plus, the theme has advanced Visual Composer page builder, that will enable you to create and edit any page or section on the theme. As well as, the powerful admin panel of the theme allows you to change the theme settings in simple clicks. So creating and maintaining a website will not be a tough work for you. After all, the theme comes with well-explained documentation and friendly customer support. 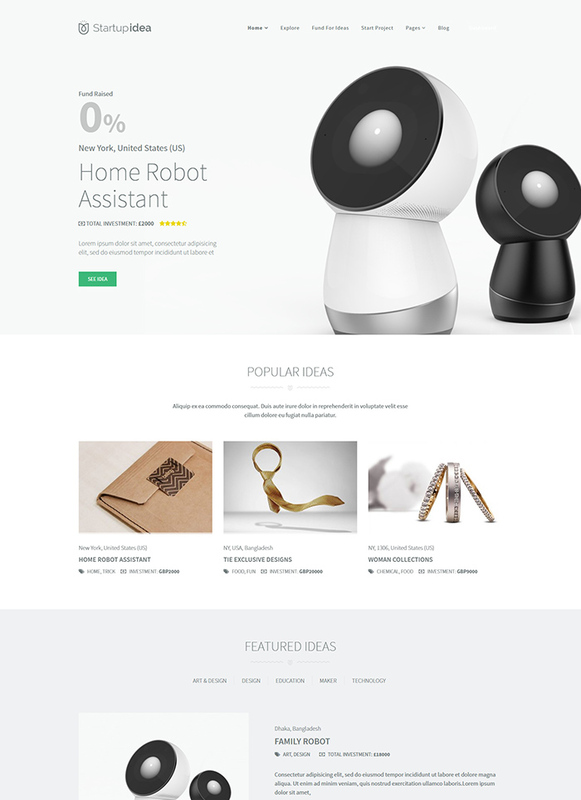 Startup Idea is creative and elegant WordPress theme created for crowdfunding. This theme’s beautiful homepage and inner pages designs empower you to present your social activities, causes, and your goals in a fine-looking design. Not only that, it responsive and retina ready, so your website will fit in all type of modern devices. Following the theme is fully compatible with the Visual Composer and Slider Revolution. First, the Visual Composer page builder helps you to create and edit the website as your wish. Second, the Slider Revolution plugin allows you to create enticing sliders to visualize your best reasons directly on the sliders. FundPress is creative and engaging crowdfunding WordPress theme. This theme perfectly suits for NGO’s, charities, and fundraising websites. The theme perfectly fits in the various devices like mobile, laptop, iPhone, and desktop. Because the theme is fully responsive and retina ready. There are both one and multipage designs available on the theme. So you can create any type of website you want in seconds. Finally, this theme comes with well-explained documentation with step by step instruction. Therefore you can you easily install and create your website with your own hands.